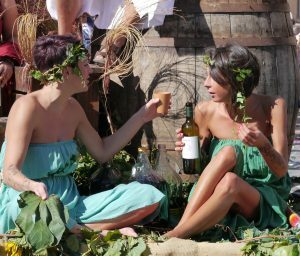 This year’s Enologica Montefalco is from Friday 15th September to Sunday 17th September when Montefalco once again opens its doors for a weekend of bacchanalian fun! 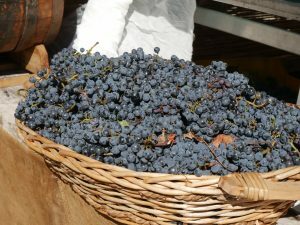 Umbria Domani – (In Italian) Shows the partaking wineries. 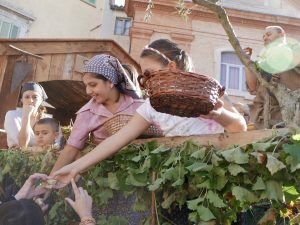 The highlight of the weekend comes after lunch on the Sunday with the Festa della Vendemmia (Grape Harvest Festival). We love this afternoon of fun most of all! 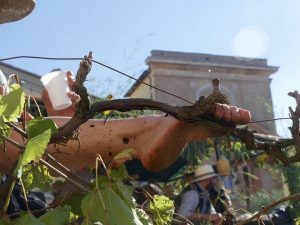 The summer of 2017 has been an absolute scorcher and by the third weekend in September, nearly all the grapes will probably have been harvested. However, the show will still go on! 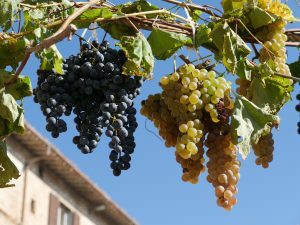 I know the grapes near our house have already been harvested – in early August! The weekend is a chance for friends to meet up and let their hair down in the central piazza in Montefalco. Wandering musicians, impromptu dancing & singing in a fantastic atmosphere. Grab yourself a free taste of local products and wine. 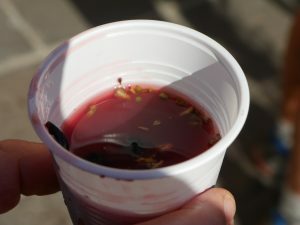 Try the freshly pressed grape juice – I mean, seriously! Try it! 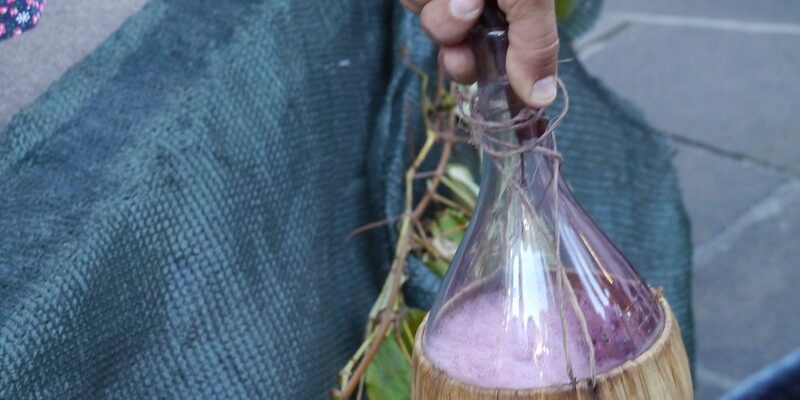 Can’t get fresher grape juice than this! 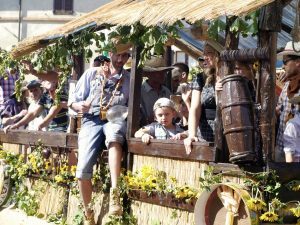 You won’t find any fancy carnival floats here – more like tractors pulling creatively decorated trailers with several generations of local folk dressed up in various costumes and ready for a big street party! 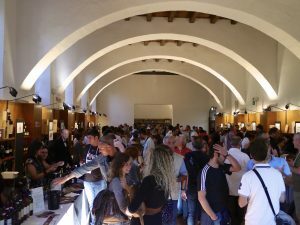 Just down the hill in the cloisters you will find many local Montefalco wineries represented for the Enologica Montefalco wine tastings! Firstly, pay for your souvenir glass & holder and away you go! In previous years there were very entertaining cooking shows with local chefs competing in the middle of the cloisters. Around the edges, under the arches, there are many stalls selling and giving away samples of local products such as cheese, oil, salumi and truffles. Inside the hall, you’ll be in wine heaven with so many of the producers represented! Come and meet the wine-makers themselves, most of the time, they will be the ones serving up the wines and are more than happy to chat to you! 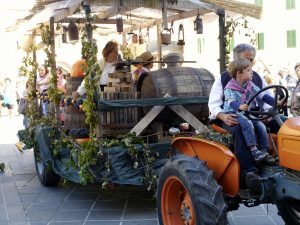 If you love wine, and have no need to get behind the wheel of your car for the rest of the day then Enologica Montefalco is absolutely the wine festival for you! Book a table for lunch in the cloisters and enjoy a local treat or two! If you can’t get a reservation there, head out to the Montefalco streets again. Make your choice from the many great restaurants in town. See below for our recommendations. Booking in advance is probably your best bet for this particular weekend! We have limited availability if you would like to book a wine tour with us on the Friday or Saturday. As a result, do contact us here to find out if we can arrange a day for you. Go on! Make a weekend of it in Montefalco and stay over! Finally, check our Sleeps and Eats for the Montefalco accommodation. You could even snag a room at one of the nearby wineries! Thanks for the information about this event. 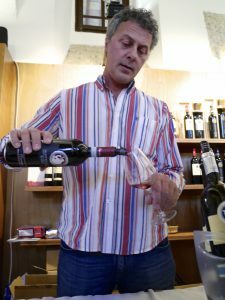 Montefalco and its wines provide quality without commercialism and this is a wonderful opportunity to find out more about the wines, the place and the people who make it so magical. What time is the parade on tomorrow, Sunday?